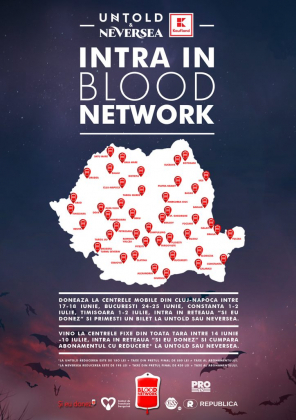 People who donate blood to mobile caravans in Cluj-Napoca, Bucharest, Constanta, and Timisoara will get a free ticket at Untold or Neversea, two of the biggest summer festivals in Romania, according to the organizers. The mobile caravans will be in Cluj-Napoca (Eroilor Blvd.) on June 17-18, Bucharest (Herastrau Park) on June 24-25, and in Constanta (Tabacarie Park) and Timisoara (Iulius Mall) on July 1-2. 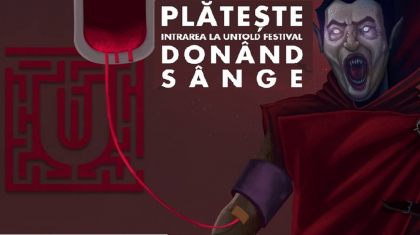 “This year, the mechanism is this: the person who donates blood to the mobile caravan and enters the Si Eu Donez database (reteaua.sieudonez.ro) receives a free ticket to Untold or Neversea,” reads a statement from the organizers, cited by local News.ro. Moreover, all those who donate blood to transfusion centers across the country between June 14 and July 10, and then enter in the Si Eu Donez network, will benefit from discounts when buying subscriptions for the two festivals. Neversea is the newest seaside festival in Romania. Its first edition is scheduled to take place from July 7 to July 9 in Constanta. Its lineup includes Tiesto, Afrojack, Fatboy Slim, Benny Benassi, Fedde Le Grand, Ferry Corsten, and Jason Derulo. Find out more here. Untold, Romania’s biggest electronic music festival, will take place in Cluj-Napoca, central Romania, between August 3 and August 6, 2017. The lineup of this year’s edition includes Dutch DJs Afrojack and Armin Van Buuren, Swedish DJ duo Axwell and Ingrosso, Belgian/Greek DJ duo Dimitri Vegas & Like Mike, Dutch DJs Hardwell and Martin Garrix, and American musician Steve Aoki. Find out more about the event here.